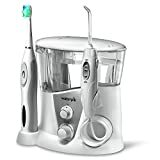 This 2-in-1 countertop water flosser unit combines a sonic toothbrush and water flosser and operates via a mains socket. Having both of these in one unit helps to save counter space and is convenient amongst other well designed features. Everything has been summed up in our Waterpik WP-900 Complete Care review so it’s easy to read what its features are and how it can benefit with your oral health. Being more than conveniently placed together, each electrical oral item helps to get your teeth and gums squeaky clean. It can be used by beginners or advanced users because of its advanced pressure control settings. Healthier gums as plaque removal with the water flosser is 50% more effective than using dental string floss and up to 80% more effective than using the Philips Sonicare Airfloss. The sonic toothbrush is 52% better at removing plaque than most of the leading sonic toothbrushes brand. Bacteria and plaque below the gumline is easier to remove because of the micro bubbles created and pushed below when brushing your teeth with the sonic toothbrush and again when using the water flosser. These can reach hard to reach areas that manual toothbrushes and string floss cannot. A fast toothbrush speed means just a few seconds on your teeth can remove almost all of the plaque there. Suitable for a number of different people to use including anyone with fitted crowns, implants, veneers or braces. Gums are given a stimulating massage which helps to boost circulation and toughen them to prevent and improve gum disease. Results from clinical tests show that the Sensonic Professional Plus brush is 29% more effective at removing plaque and can improve gum health up to 26% better than most of the leading sonic toothbrush brands. A few seconds of water flossing can remove the majority of plaque buildup so just think how much can be done in 1 minute. Like most of the Waterpik’s best water flossers, it’s fitted with an advanced pressure control system of 10 settings ranging from 10 to 100 psi which is quite intense on the maximum level. The vibrations and pulsations combined ensures the effective removal of plaque and food debris. With warm water and set on the lowest setting, it provides a soothing clean to sensitive gums or inflamed gums to efficiently remove plaque and harmful bacteria. On a full charge, the sonic toothbrush is very powerful and effective which cleans just as well as many other standalone sonicare toothbrushes. It uses the 2 speed settings to control the pressure of the vibrations and it’s gentle enough on the slow speed for anyone with sensitive teeth. The slow speed may feel like you need to brush for longer but in fact it’s just as efficient at cleaning as when it’s on the fast speed. Described as a loud hum, the water flosser is actually not as loud as it sounds to someone in the next room. It’s loud in your ears when you’re using it but not deafening. 2 Classic Jet Tips – ideal for general everyday use, this helps you to regularly maintain your teeth and gums. It works well in removing plaque accumulated from a day’s buildup and any food particles. Orthodontic Tip – with its small cluster of bristles forming a tiny brush, this tip can efficiently clean around brackets and in between the wires of braces. It’s used to water floss along the gumline whilst scrubbing stubborn and accumulated plaque on braces and the teeth surfaces surrounding it for maximum plaque and food debris removal. Plaque Seeker Tip – the 3 slim tufts of bristle brushes can get into hard to reach areas to remove stubborn plaque which is effective for use on implants, crowns, veneers, bridges and any other cosmetic or dental work. Not only is it easier to use than dental floss but it works better and brings gums back to a healthy state. Pik Pocket Tip – the narrow and pointed tip can get the spray of water into gum pockets up to 6mm deep which traditional dental floss cannot do. People with gum pockets felt their teeth were much cleaner with regular use which also helped to minimise the depth of their gum pockets by a bit. Tongue Cleaner – ideal for scraping off bacteria on the tongue to prevent bad breath. It’s quite effective when it’s used on a daily basis and leaves the tongue and mouth feeling fresher and cleaner. Toothbrush Tip – gives the convenience of brushing your teeth and water flossing at the same time. It’s great to use when you’re stuck on time or just want to get to bed and it still works really well at plaque removal and getting rid of the majority of food particles. 2 Standard Brushes – medium sized with soft, end rounded filaments, this brush can give a gentle clean that’s 25% faster than well-known sonic toothbrushes. It leaves teeth feeling very clean and fresh after the full 2 minute timed brushing and because of its efficiency at plaque removal, teeth naturally whiten over time. 2 Compact Brushes – same as the Standard Brush head but in a small and slimmer brush head design that’s ideal for a more precise clean and getting into hard to reach areas. People with smaller mouths can use this as well. Interdental Brush – shaped with a pointed brush tip, this brush head is great for cleaning in between teeth. It’s effective in getting bits out in between teeth that are close together and for getting to tough areas. All the Waterpik tips and brush heads can be stored within the storage compartment of the water tank which can fit up to 5 tips. Fitted with an European 2 pin plug, the Waterpik WP-900 Complete Care can be plugged into any UK bathroom that has the shaver socket installed. Alternatively, it can be plugged into a shaver adaptor and plugged into the 3 pin UK plug socket. It works on a global voltage of 110-240v so it can be used in most countries with this compatibility. Watch the Waterpik WP-900 Complete Care in action – see how it effectively flosses and cleans teeth. Being one of the best oral irrigators on the market that offers a complete oral care routine, this Waterpik model proves itself with so many great features and benefits that has been outlined in our Waterpik WP-900 Complete Care review. Unless you require an even more powerful and advanced sonic toothbrush seperately (we recommend Philips Sonicare models), then there’s really no need to spend more money to buy a separate water flosser and sonic toothbrush when you can have the best of both worlds in one. Please Note: There is now an updated and more advanced model called the WP-950.